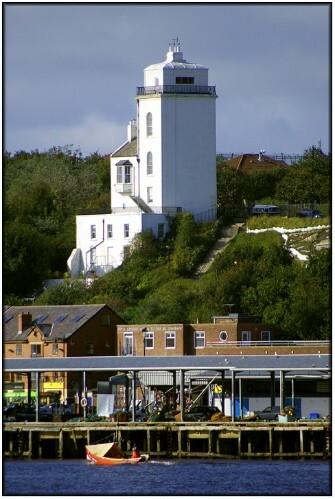 The original pair of range lights, of which the Old High Light is the sole survivor, was replaced in 1807 by the present lights. There general design is identical, and this is the "new" High Light seen here from South Shields. The design of these lights is quite unusual, with a square cross-section, rather squat lantern, from which the light shines (or possibly shone) through what appears to be a disproportionately small, rectangular window. The roof of the lantern looks like a severely flattened version of the ogee-hipped roof of the lantern on the Old High Light. The Fishquay from which the lights take their name can be seen in the foreground of this photograph.